DENVER (AP) Kyle Freeland got the Rockies going with his arm and his bat. Freeland pitched effectively into the sixth inning and doubled during Colorado’s three-run fourth Tuesday night, leading the Rockies to an 11-4 win over the San Francisco Giants, who lost two pitchers to injury – including starter Jeff Samardzija. ”That’s kind of how I was raised, to play this game as hard as you can, and no matter what happens, at the end of the day you’re going to feel better about yourself, regardless of the outcome,” he explained. David Dahl had a two-run shot off reliever Cory Gearrin as part of Colorado’s four-run seventh, the first pinch-hit homer of his career. ”We’re just trying to have quality at-bats, not being too selfish about it, just trying to get a good pitch to hit and get on base, move guys over,” Gonzalez said. Evan Longoria hit two home runs and Buster Posey also went deep for the Giants. All three were solo shots. It was Longoria’s 18th career multihomer game and first since July 17, 2016, with Tampa Bay. The younger Rodriguez, called up Monday from Triple-A Sacramento, went 3 1/3 innings and allowed four runs – one earned. He was removed after being struck in the right shin by a line drive off the bat of Desmond with one out in the fifth. Leading 2-0, the Rockies took advantage of some sloppy defense by the Giants to add three unearned runs in the fourth. Rodriguez fanned the first two hitters he faced before Freeland doubled. Second baseman Kelby Tomlinson failed to handle Charlie Blackmon’s grounder for his second error of the night, allowing Freeland to score. Blackmon advanced to third on a throwing error by first baseman Brandon Belt, and Parra and Arenado followed with RBI doubles. Tomlinson made a third error when his high toss on Story’s eighth-inning fielder’s choice pulled shortstop Brandon Crawford off second base. ”Obviously, it’s part of the game. You don’t like to see it. I’m not sure what happened with Samardzija. The young kid, that was rough. Desmond hit a bullet. 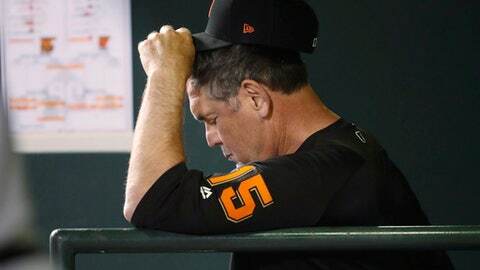 Every night, there seems to be something on the injury front or something physical in this game, but it’s part of competing at this level.” – Rockies manager Bud Black expressing empathy over two Giants pitchers getting hurt. Giants: LHP Madison Bumgarner is scheduled to make his second minor league rehab start Thursday, at Class A San Jose. He is slated to throw 70-75 pitches and provided he comes out of the outing well, he’s expected to be reinstated from the 60-day disabled list. ”Hopefully, knock on wood, all goes well, he feels fine when he comes out of it, and he’ll be pitching for us,” manager Bruce Bochy said. Bumgarner broke his left hand in his final spring training game against Kansas City on March 23 when he was struck by a line drive. He pitched 3 2/3 scoreless innings with eight strikeouts in his first rehab start for Triple-A Sacramento last Saturday.